The most common definition is: the ability to change or be changed in order to fit or work better in some situation or for some purpose. Adaptability is something we can all work on to be better at what we do each day. Having the flexibility to change to suit current circumstances or the skill to build rapport with people around you can also ensure you become more successful and powerful in a leadership role. Of course, not all powerful people become leaders and not all leaders are powerful people. 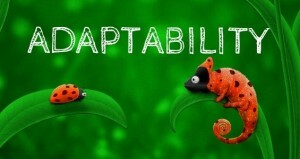 So why is adaptability so important? Because whoever can adapt with the most ease will control the environment and whoever controls the environment is the most powerful person in the room. If you have a leader in your workplace who is rigid and single minded in their views, I can predict with a certain amount of accuracy that your workplace would be suffering. I am guessing that innovation is not celebrated, creative problem solving is not viewed as a strength and collaborative working arrangements never get of the ground. On the other hand, if you are being led by a person who has a lot of behavioural flexibility, or the ability to be adaptable, then I imagine that in your workplace ideas, innovation and collaboration is an integral part of the businesses success. In fact, it is required of you. Now for the good news – adaptability is a learnt skill. With some time and practise, you can become quite adaptable. The very first part of learning how to become adaptable is to know and appreciate exactly how you like to operate, how you view the world and to understand your natural strengths and development areas. Once you have a better understanding of self you can start to appreciate the difference between yourself and others. Our view is only one view, it is never the world view (even though sometimes we do like to think it is the world view). The key to being adaptable is to appreciate this. Once a person understands this, they can start to consider that others have a lot to offer, better ways to do tasks and more efficient ways to run projects for example. By being able to adapt to another person’s way of thinking (or their view of the world) and seeing it from their perspective, more possibilities start to open up and many more possible outcomes for a situation become visible. Being adaptable allows a person to stay positive and happy despite external circumstances. In fact, it allows a person to lead with even more effectiveness and influence creating a better environment for everyone. To have power over your own life and to be a leader, it is clear to see that adaptability is a necessary quality. How adaptable are you?